There has been a redoubling of Israeli efforts to evict Palestinians in occupied East Jerusalem and deny remaining Palestinian residents the right to a livelihood by demolishing Palestinian shops and businesses. The Palestinian neighbourhood of Silwan in the East Jerusalem zone is a hotspot for evictions. With approval from Israel’s High Court for the eviction of 700 residents, the way is clear for another neat trick of Israeli law that further entrenches the occupation and the “Israelification” of Palestinian neighbourhoods. Israel’s Absentee Property law allows for “abandoned” properties to be seized by the Israeli state and ownership “transferred” to Israeli settlers. The latest round of demolitions has been particularly disastrous for Palestinians in the Shuafat refugee camp. Dozens of families have been left without any means of making a living after 16 micro-businesses in the camp were demolished by Israeli authorities recently. Putting that together with repeated demolitions of “illegal” residences has meant adding homelessness and acute poverty to statelessness. Unemployment rates across the Occupied Territories averages 32.4%. Of those Palestinians lucky enough to have a job, many struggle to earn a minimum wage. The companies responsible for the equipment used in the demolitions make legitimate boycott, divestment and sanctions targets. There are plenty of images and footage of Caterpillar, JCB, Volvo and Hyundai vehicles tearing into what remains of many Palestinian families’ homes. Much of the same equipment is used to shore up embankments on the edge of the Gaza Strip from which Israeli snipers take aim at unarmed protesters. The Bedouin village of Khan Al Ahmar is the most prominent example of Israel’s determination to wipe Palestinian and Bedouin identity from the landscape. Uncertainty over when the demolition of the village — which was approved by the High Court in May this year — will take place has meant unprecedented levels of anxiety for its residents. Israeli Prime Minister Benjamin Netanyahu has added to the anxiety with recent comments to his cabinet. With no fixed date, but still determined to destroy the village, Netanyahu said it would take place “very soon”. Whenever it takes place, there are questions being asked about the use of British construction company JCB’s equipment in destruction of Khan Al Ahmar. 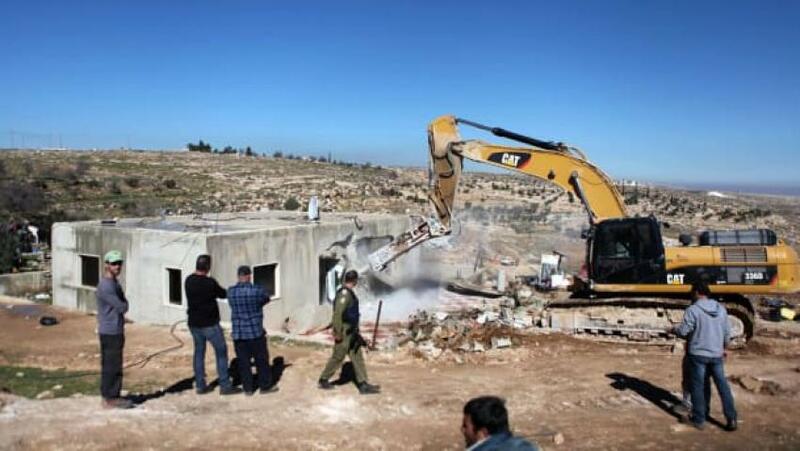 Some homes and villages are destroyed repeatedly as Palestinian families build and rebuild in response to demolitions. Building and rebuilding by Palestinian families is nearly always illegal since the necessary permits are almost impossible to obtain. Families that don’t demolish their own homes in response to demolition orders are billed for the cost of having Israeli authorities do it for them. The village of Al Araqib, as one example, may hold some kind of record after being demolished for the 134th time. With Al Araqib’s residents seemingly not getting the message, the demolition count looks set to rise. Israel cannot expect anyone to believe it is honestly prepared to negotiate for peace with Palestine while continuing to make the Palestinian people homeless. This means it is full steam ahead for project Obliterate Palestine. Posted on Green Left November 30, 2018.